Eating a healthy diet around the holidays can be challenging. Many of our favorite foods are served together in large portions, and family and friends go out of their way to make the foods we like. Not to mention, more shopping and errands to run can result in eating too much fast food. Over November and December each year, the average American gains five pounds: the “festive five,” they are called. It often takes months to lose the extra weight; some people never do, and year after year those pounds add up. With a little planning, you can get through the holidays feeling your best without gaining weight. Moderation is the key. It’s all about making good choices. Pick your favorite foods and enjoy them in reasonable portions. Skip what’s less important. Don’t like candied sweet potatoes covered with marshmallows? Have a green salad instead and use the calories you saved to indulge in a favorite, such as pumpkin pie. Let your family and friends know that holiday eating is a challenge, and suggest an activity that doesn’t involve food. Ask them to go to the mall, go caroling, visit a holiday lighting display, see a movie or just go for a walk. Bring a healthy dish that you enjoy so you know you have something good to eat. Eat a snack before you leave home. If you feel hungry when you arrive, you may eat too much. If it’s a buffet, look at all the options and decide which foods are worth eating, and which can be ignored. Don’t stand near the food so you won’t be tempted to graze. Choose raw fruits and vegetables – you won’t eat too many if you have to chew a lot. If you drink alcohol, have just one glass. Alcohol has almost 50 percent more calories than pure sugar. Most mixers are also high in calories – as are beer and wine. These recipes can travel easily to a party, potluck dinner or other holiday occasion. Not only will your dish be a healthy choice for you, it will be healthy for everyone with you. You can make this ahead and heat in the microwave before serving. 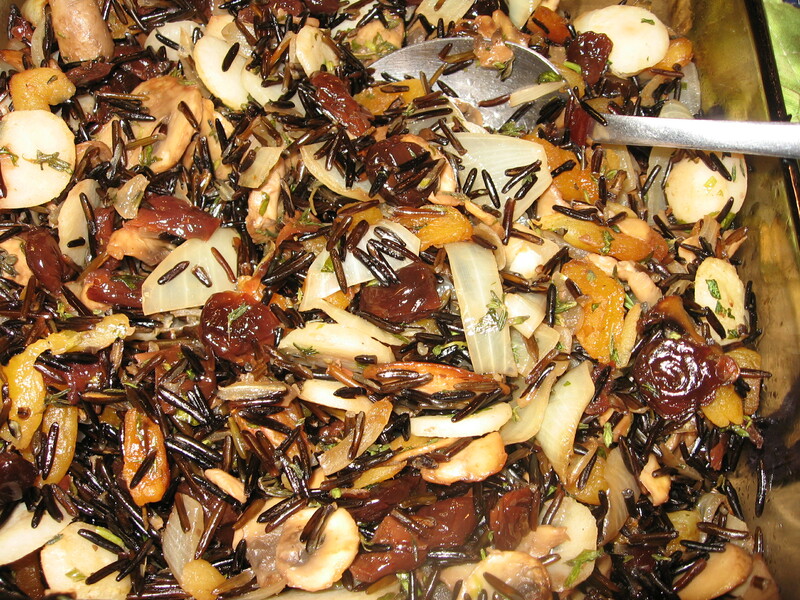 Cook 2 cups wild rice and 2 cups of white or brown rice in 3 cups low-sodium broth or water. Saute onions, mushrooms, apricots and cranberries in butter. Add water chestnuts, pistachios and rice. Cook and stir for about 5 minutes. Add fresh herbs, put in greased baking dish and bake about 30 minutes in 350 degree oven. You can reheat in microwave. Serve with turkey. You can double or triple this recipe and freeze it; it keeps well for months. This pie has less than half the calories of regular pie. Make ahead and take it cold. Soak gelatin in cold water. Beat egg yolks slightly. Add pumpkin, sugar, milk and spices to egg yolks. Stirring often, cook over hot water in double boiler or in microwave until thick enough to coat the back of a spoon. Stir in gelatin until dissolved. Cool. Whip egg whites until stiff. When pumpkin mixture begins to set, stir in 1/2 cup sugar and fold in egg whites. Fill pie shell and chill 4 hours or overnight.